With a discreet HD security camera, Maximus Camera Floodlight allows your to safely guide your home during daylight, and at night from anywhere; with 270 degree and 70-foot detection range, and a with 2400-lumen floodlight, the Maximus Camera Floodlight illuminates every angle. Sophisticated light controls. Motion activated, dusk-to-dawn, turn on/off using Kuna App. An energy efficient outdoor wall fixture that is basic in design but practical in application. finished in textured black with frosted white glass make this 13 watt fixture perfect for the energy conscious home owner. The dusk to dawn photocell will add security and comfort. Add style to your home and landscaping with the Hampton Bay 12V LowVage 50W Aged Brass Cast Aluminum Flood Light. It's equipped with a UV-protected black finish and heat-resistant glass lens for longevity. An adjustable lantern head enables you to direct the light exactly where you need it. One black cast aluminum flood light, one 50W halogen MR16 bulb, bonus 35W MR16 bulb, and 12-inch SPT-1 18-gauge cable with easy quick-clip connector are all included. Smart Motion Security Light - Textured Black With a discreet HD security camera, Maximus Camera Floodlight allows your to safely guide your home during daylight, and at night from anywhere; with 270 degree and 70-foot detection range, and a with 2400-lumen floodlight, the Maximus Camera Floodlight illuminates every angle. 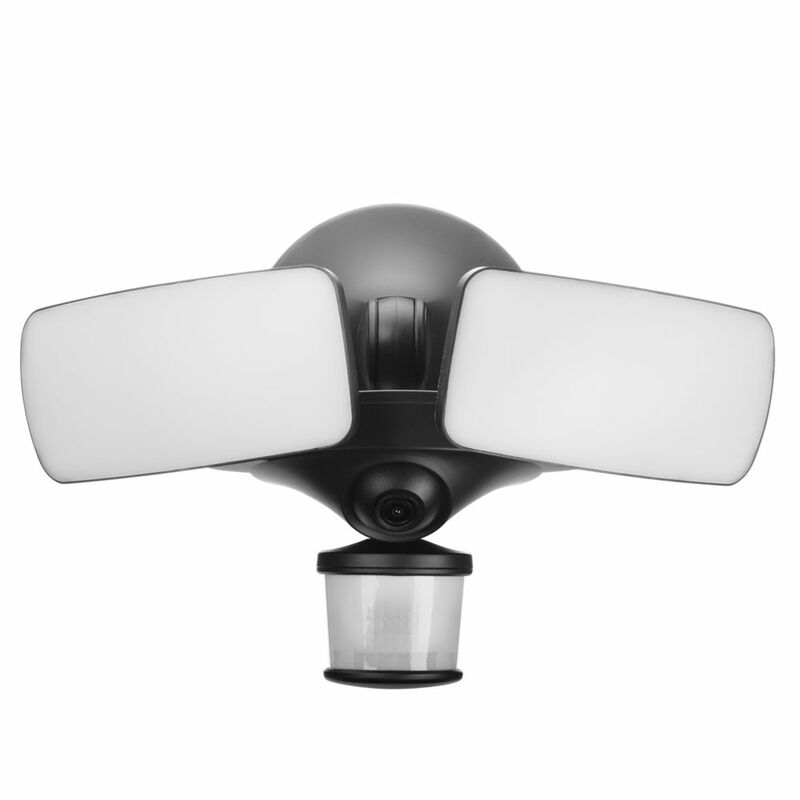 Smart Motion Security Light - Textured Black is rated 4.0 out of 5 by 31. Rated 5 out of 5 by Joseph from Maximus is living up to my expectation. The coverage area... Maximus is living up to my expectation. The coverage area is wide enough for me to see my entire garage entrance and drive way all the way past the street and up to the front of my neighbors across the street during the day. The led light at night also illuminates my entire drive way up to the street. The good aspects are that I can dim the light to my satisfaction. I find the alerts very irritating though. This thing is so sensitive it picks up and alerts me when a squirrel is crossing my driveway. I have turned down the sensitivity, but the alerts still come. I had to turn off the alerts because each time a car passes the front of my house, I get an alert and that goes on all day and basically all night.Both day and night vision are clear and vivid. I use the dusk to dawn setting so I do not worry about lack of night vision of the camera. Highly recommended. Rated 2 out of 5 by Allen from When it works it is great, clear image with a bright light. You have to pay a monthly fee to view... When it works it is great, clear image with a bright light. You have to pay a monthly fee to view past videos over 2 hours old, this seams like a rip off. You also have to unplug and reboot often as it locks up. Rated 3 out of 5 by Edgar from Not the best out there. Ring has a flood light... Not the best out there. Ring has a flood light camera system that just simply works better with fewer false positives out of the box where Maximus can only be achieved with a subscription and even then is not as good. Rated 5 out of 5 by Lucian from Great features! I bought this product about two months ago and wanted to give myself a chance to see how it works before writing a review. So far I am very satisfied with it. It took a bit of time to install it, since I did not have a junction box available where to connect it and had to install one first. A bit of a drawback is the connecting screw that is the only connection to a bar that is installed over the junction box to keep the camera attached to the box. I think I would want to see a more sturdy way of attaching the camera to the junction box. But once in place, the camera is very easy to adjust manually (to orient it toward the area in need of surveillance) and to control using the Kuna app that comes with it. From the Kuna app, one can really control the various features. The camera has proven very versatile until now and I like the option of controling it over the internet when I travel overseas. The Artificial Intelligence (AI) option is great and I had a chance to try it during the free trial of extra features. It is really accurate and helps to pinpoint the camera to record only a certain area in need of surveillance although it can view a larger area. The pre-recorded messages are excellent, and the Halloween sounds were really funny. Otherwise, I am awaiting the cold weather to see how the camera will function in sub-zero temperatures during the Montreal winters.